Foundation Medicine and Pfizer plan to develop and commercialize companion diagnostics (CDx) for the pharma giant’s oncology portfolio, through a collaboration disclosed today by the molecular information company. Foundation Medicine said the companion diagnostics would be launched as updates to the company’s FoundationOne CDx, an FDA-approved comprehensive genomic profiling (CGP) assay for all solid tumors that incorporates multiple tests. Under the collaboration, Pfizer will gain access to Foundation Medicine’s FoundationInsights™ data analytics platform, designed to facilitate novel biomarker discovery and optimize clinical trial design. FoundationInsights is a secure web application pulling data from Foundation Medicine’s FoundationCore™ knowledge base, which according to the company includes more than 120,000 genomic profiles and data on more than 150 cancer subtypes. The platform is designed to allow researchers to profile large patient cohorts for de novo biomarker discovery or identification of patients for clinical trials; as well as to identify trends in complex biomarkers; leverage the company’s network of researchers, institutions, and biopharmas; and carry out additional analysis based on the data. “The combination of our FDA-approved comprehensive genomic profiling platform and molecular information solutions, coupled with Pfizer’s robust oncology portfolio, enables us to enhance the impact of precision oncology to advance patient care,” Melanie Nallicheri, Foundation medicine’s CBO and head of biopharma, said in a statement. Pfizer’s oncology pipeline includes 10 FDA-approved oncology treatments indicated for a wide range of solid tumors and hematologic malignancies—and a pipeline with 17 assets in clinical trials, including 19 Phase III studies. Pfizer has moved to beef up its cancer portfolio in recent years. The collaboration also reflects Foundation Medicine’s reliance on pharma partners for roughly two-thirds of its revenue. Just last week, in disclosing preliminary unaudited 2017 results, Foundation Med reported projected revenue from biopharmas of approximately $33.4 million in the fourth quarter of 2017 and approximately $99.7 million for all of 2017, compared to $19.0 million and $78.8 million in the fourth quarter and all of 2016, respectively. The company reported 6,206 tests to biopharmaceutical customers during Q4 2017. FoundationOne CDx, a next-generation sequencing (NGS)-based in vitro diagnostic (IVD), is a companion diagnostic designed to detect substitutions, insertion and deletion alterations (indels), and copy number alterations (CNAs) in 324 genes and select gene rearrangements. FoundationOne CDx is FDA-approved as a CGP assay for all solid tumors and a broad companion diagnostic for patients with certain types of non-small cell lung cancer, melanoma, colorectal cancer, ovarian cancer or breast cancer to identify those patients who may benefit from treatment with one of 17 on-label targeted therapies. The test also detects genomic signatures, including microsatellite instability (MSI) and tumor mutational burden (TMB), using DNA isolated from formalin-fixed paraffin embedded (FFPE) tumor tissue specimens. 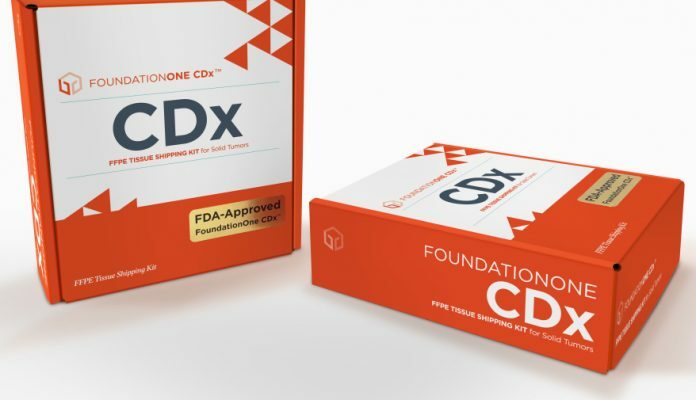 FoundationOne CDx results are delivered in an integrated report that identifies alterations matched to FDA-approved therapies, identifies additional alterations in genes known to drive cancer growth, furnishes information about genomic biomarkers, including MSI and TMB, provides clinical trial information, and includes interpretation. In December, Foundation Medicine gained both approval for FoundationOne CDx and a concurrent preliminary National Coverage Determination (NCD) from the Centers for Medicare & Medicaid Services (CMS)—becoming the second IVD to be approved and covered following parallel review by the agencies. A final policy is expected to be issued during the first quarter of 2018 following public comment on the preliminary NCD and an administrative period.